This is it: You're ready to quit. You've been dreaming of this moment for months (or years) and you are all set to let the company know you're moving on. Well, before you throw down your resignation letter and waltz out of the door, take some time to make sure you do this the right way. 1. 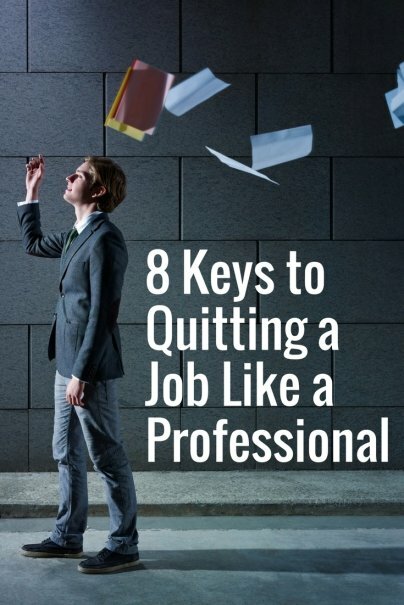 First and foremost — Are you sure you're ready to quit? Like, really sure? Because once you hand in your notice, you've put yourself on a path that leads directly out of that company. So, make sure you're leaving for the right reasons. Some people act irrationally after a major upheaval or event at work, and hand in their notice while they're still in a cloud of anger and frustration. If you have been feeling this, and have decided "I've had enough," then take at least a few days to cool off and think it over. Talk to people you trust, and explain the situation. They may agree with you, and say that you're working in a toxic environment that is hurting your health. But, they may say that you have a good job with good coworkers, and that you're blowing things out of proportion. Most states in the U.S. have something called "at-will employment." This means your employer can terminate you at any time, without any reason at all, and without any kind of warning. Conversely, you have the exact same rights with regard to leaving. You can quit at any time, for whatever reason (even if you don't have one), and walk out of the door without giving notice. Some employers like to have it both ways. They will be more than happy to let you go at the drop of a hat, but the company handbook states that you are required to provide a minimum of two weeks' notice. This is just something the company wants, but cannot enforce. If you live in an at-will employment state, two weeks' notice is not required. But, if you don't provide it, and leave the company in the lurch, you are potentially burning a valuable bridge. You always want to leave on good terms if you can, so unless the situation requires an immediate exit, give your employer the two weeks they expect. Now is the time to start working on a resignation letter. If you have been at the company less than a year, you don't have to go overboard. Be polite, explain briefly that you are moving on to a new stage in your career, and thank the company for the opportunity they gave you. If you have a lot of years under your belt with the company, you may also want to add in some of the significant achievements and successes you had at the company, and call out people who genuinely made a difference to you, and helped you grow. You may be tempted to throw people under the bus in this letter, or point out everything that is wrong with the company. Don't do it. This is a permanent record, signed by you, and that can come back to bite you. There are all sorts of reasons to wait until Friday to hand in your notice. Midweek is just an odd time, and on a Monday or Tuesday, you are catching people as they are about to dive into a full week of work. Doing it on a Friday is best. It gives you and your employer the rest of the day, and the weekend, to think about it and come to terms with the decision. If you are a key member of the team, your boss will likely need to come up with a game plan on how to replace you. He or she may also want to make you a counteroffer, asking you to sit on your resignation and think it over. For this reason, Friday is the most strategic day to hand in your notice. You've handed in your two weeks' notice, and now you can just coast for the next 14 days, right? Well, not so fast. It can be tempting to slack off, take long lunch breaks, arrive late, leave early, and have a general disregard for the rules you used to obey. But that is not going to sit well with a company that is still paying your salary. You can have the "What are they gonna do, fire me?" attitude, but it's not professional. You have history with this company, it has paid your salary and probably provided health benefits, and you owe it to the company, and yourself, to act as professionally as you did before you resigned. In some cases, if you don't have another job to go to, the company may well ask you to stay on as a contractor, at a higher rate of pay, until they find your replacement. They will not offer this if you are just treating the job as a joke. After you resign, you should offer your services in finding your replacement. You should also be willing to speak to the departments you work with on a regular basis, and ask them what you can do in your final two weeks to make sure everything runs smoothly once you are gone. Do they need certain files or contact names? Do they need you to show them how certain processes are managed, from inception through completion? Take this time to ensure that when you leave, the ship is not sinking without you. A lot of people who resign have some sharp words for the human resources department, or the owner of the company. And while it is OK to point out areas of improvement, you should do it in the most constructive way you can. This should not be the time to do corporate assassinations on people who've crossed you over the years. If you have genuine concerns about some of the people you are leaving behind due to a toxic work environment, then by all means bring those up. But be delicate about it. Talk about the need for improved communication, or more flexible working hours and telecommuting. Give them a checklist that makes them think you really want the company to flourish after you depart. Seriously, don't burn a bridge. You don't know what could happen in the future, and a company that you have a history with can be a powerful ally when you need help. If you ever need to pick up contract work or come back in a different role, you will want to have people to reach out to. So, use LinkedIn and social media to stay in touch. Send the occasional email to people you know there, asking how they're doing. Be a friend to them. It can really pay dividends should your departure become a mistake.